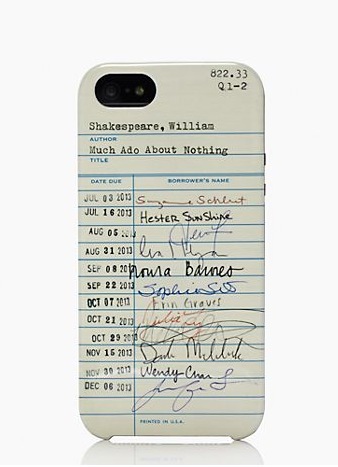 For $40 you can have a iphone case that looks like it was taken from a library that doesn’t believe in patron privacy. As much as I adore the idea that someone would be checking out a Shakespeare book nearly weekly (in 2013! It’s free on the internet) and personally love the iconography of these cards, it’s always amusing to see them in the wild appropriated as something fashionable. Kate Spade has a bunch of new library-themed items which must mean that at least somewhere, libraries are seen as something that are worth money. Fun fact, the signatures on the library card–the ones that make my librarian heart agitated–are names of Kate Spade employees. Hester Sunshine is a Kate Spade blogger. Erin Graves works in marketing, as does Noura Barnes and Sophia Smith and Wendy Chan. Julie Ly is in PR and Suzanne Schloot works in social media marketing. Other folks have signatures that are too obscure (smart move) or names that are too general to track down. So hey, this is nice and a bunch of people have sent it to me. At the same time, it sort of fetishizes the library (and makes money for the creators) without really passing on any of that whuffie to the library itself (especially in New York with its sets of beleaguered library systems). I have similar feelings about the Little Free Libraries. I like them. 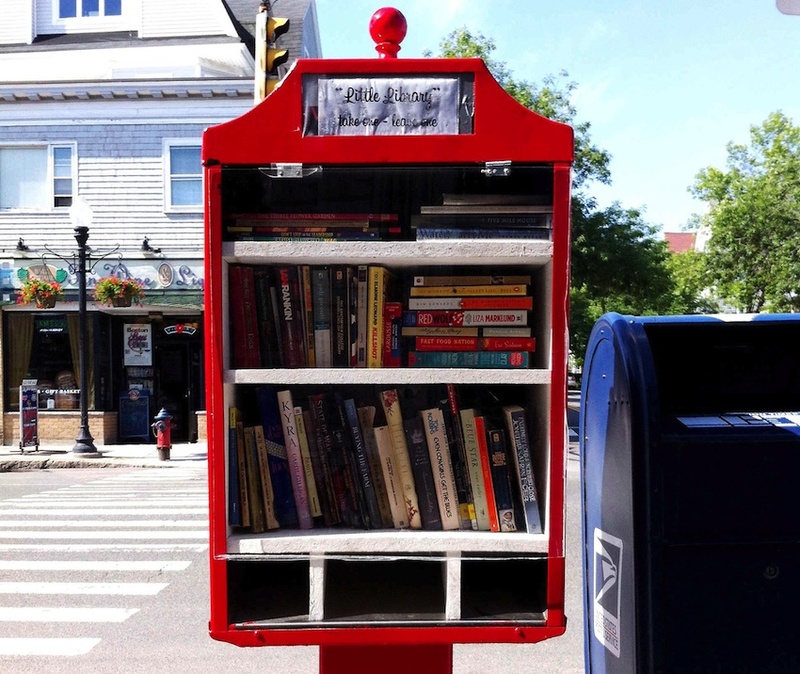 They are a fun and neat idea for people to get other people interested in reading and the community-building power of books. I am all for both of those things. But because they are called libraries, people look to me and my library worker friends and say “Hey what do you think? Do you wish you’d thought of this?” and my response, which I try to keep from sounding crabby, is that I love these things but I’m not sure why they call them libraries instead of, you know, community bookshelves which is actually what they are. Except I know why. Because the word library is evocative of a whole bunch of things, from now stretching deep into the past. It has gravitas and comes with a bunch of associations that you can sort of get for free by linking your thing to libraries. Except libraries aren’t free. And the work that goes into keeping them running (which is a lot more than keeping a bookshelf stocked) is complicated, sometimes thankless and under attack from people who think somehow that libraries are not fashionable enough, not hip or current enough, that our day has passed. So please feel free to quit sending me this iphone case, as much as I love it, and think about why New York loves this sort of thing and is trying to sell off their library real estate in New York City and gut the stacks. Aw, but Jessamyn, this is the kind if thing that gets lots of likes on the Library FB page. I’ve been frustrated by the Little Libraries thing for a while, even as some of the folks I work with are embracing the concept, and you finally put words around my discomfort… They’re not libraries, and I’m concerned that by calling them libraries we allow people to ignore that the hard, skilled work of building and running a true library. As bad as the fake checkout card is — try fabric with an erroneous call number! Great point. While we understand the greatest compliment is someone else creating an imitation of the real thing, it’s sometimes annoying the appropriation for just(emphasis) art’s sake, by using the library iconography/metaphor. No linkage to promote the value of existing libraries. Just a dusty archival image. Here’s another story, the adoption of Dublin Core metadata principles..by other professions geospatial mapping, etc. and even in general Google searches, the library world’s origins is not clearly and not repeatedly expressed in wikipedia, etc. other common digital sources.